You got that right! I went to a general parts store nearby and bought 10 of them...…….. I have 4 left!! One time I even stripped the cam plate out again to retrieve the one I actually saw drop down and in. I didn't want any UFO's inside a dizzy at 2500 rpm! Thank you for all the help. With a little of patience, a long nose pliers and a pair of tweezers I was able to remove it. The distributor already had the L10 slot. I had already ordered the Mr. Gasket spring kit. I will putting it all together this week. I have another question but before I start another thread let me try it here. 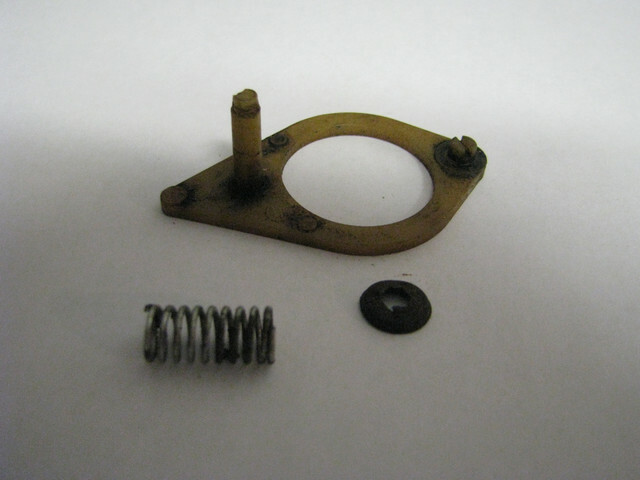 The breaker plate is held in place by a spring and a retainer that holds said spring. This retainer attaches to a plastic shaft that sticks out through the plate. The retainer went flying somewhere in the garage and I abandoned the search after an hour . Any ideas on where to get the retainer or can I use another type of clip to hold the spring. (02-04-2019, 12:36 PM)tony-muscle Wrote: I have another question but before I start another thread let me try it here. Tony, My old mind is not seeing what you mean exactly. I looked at my pics, but I'm not seeing the retainer and spring. Can you post a pic of that please? I borrowed this picture from the web. I circled in yellow the retainer I am referring to. I am finding out that it is part of the breaker plate D2PZ 12151-A. I will guess that they don't sell this little retainer separately but I am hoping there are other alternatives. Tony, this is what you need. This is used, well used, but if you want it. PM me your address and I'll mail it to you. OR it will show you what you need. I think you may still buy this from a Ford dealership. Worth a try. I do have a brand new Motorcraft breaker plate I think I took out of a Cardone Select distributor, but I need to keep that one. Also that reminds me, you may be able to get parts from Cardone, also worth a try. (02-04-2019, 05:33 PM)Stanglover Wrote: Tony, this is what you need. This is used, well used, but if you want it. PM me your address and I'll mail it to you. OR it will show you what you need. I think you may still buy this from a Ford dealership. Worth a try. I do have a brand new Motorcraft breaker plate I think I took out of a Cardone Select distributor, but I need to keep that one. Also that reminds me, you may be able to get parts from Cardone, also worth a try. Thank you Geoff. Today I received the parts and I was able to finish assembling the distributor. I also happened to find the old nut retainer wedged under the wheel of the engine hoist after I lost the one he sent. I actually found both, so now I have a spare one. 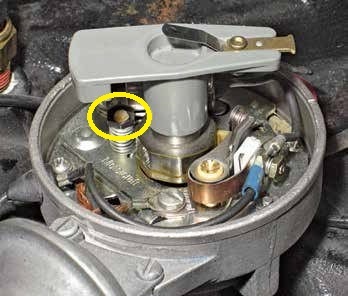 The reason I was having so much trouble with the nut retainer is that the plastic protruding shaft was worn out which allowed the retainer to slide out. I ended up inserting the nut retainer and clamping it onto the plastic shaft with pliers. Geoff is a great member and didn't even want me to pay for shipping. Thank you! Tony, you're most welcome. I'm happy you were able to fix it up. I knew the clip was a bit distorted and the plastic shaft tip was also damaged, so like I said, "well used"
A tip for others doing this is to used a small 'nut driver' that fits into the clip. That way you will push the clip on the shaft evenly and straight. Thought of this after. Thank you also for the compliments. Edit note; Springs, you may find it better to use the factory heavy spring and one of the Mr Gasket. Adjust the heavy spring so it is just slightly lose on the posts, i.e. no tension on it. That way it will not take effect until the revs increase. That is what worked best for my 4V engine.